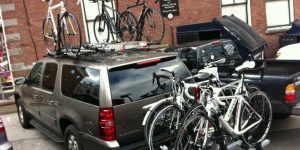 Should You Buy a Roof or Hitch / Trunk Mounted Bike Rack? Should You Buy a Roof, Hitch or Trunk Mounted Bike Rack? One of the questions that I get asked the most is whether it is better to buy a roof rack for transporting bicycles or a hitch/trunk mounted rack. Unfortunately, there is no easy answer to this question as it really depends on what you need and expect from the rack. The type of vehicle you … Continue reading Should You Buy a Roof, Hitch or Trunk Mounted Bike Rack?